Two brothers living in England in 1595 have had their playwriting careers upended by the arrival of a new guy from Stratford upon Avon, William Shakespeare. That’s the plot of Something Rotten, a new musical that opened on Broadway in 2015. Karey and Wayne Kirkpatrick (also brothers!) are the co-authors, along with John Farrell. 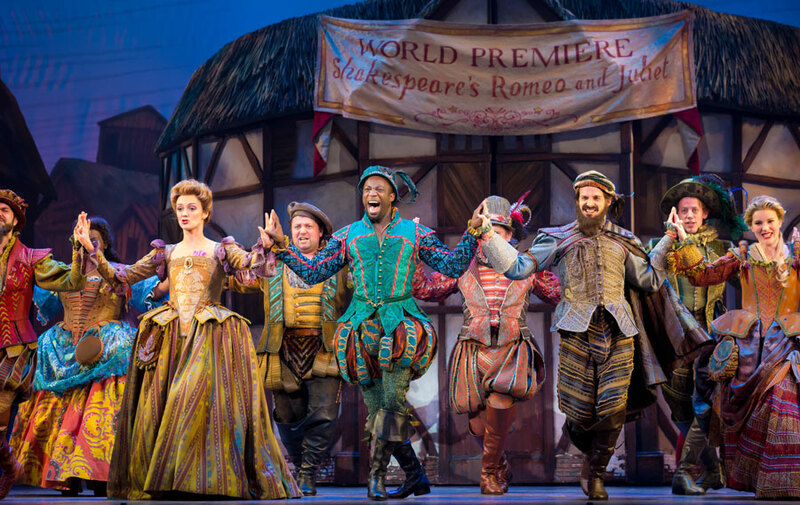 On the Folger’s Shakespeare Unlimited podcast, Karey and Wayne share more about Something Rotten, their perspective on Shakespeare, and how it all came together. Here are some highlights from the full interview, which you can listen to on SoundCloud, iTunes, Google Play, or NPR One. I don’t know that spoofing Shakespeare was the initial idea. We just, we wanted to write a musical. And actually we don’t really know how the idea came about, it was so organic. You know, there was a lot of: “what if two writers were just trying to write a hit and they were constantly in the shadow of the guy that everything he wrote turned to gold?” And each of us, we all have someone that is always doing a lot better than we are. Yeah, I think we were aware of the fact that he was, you know, he wasn’t as popular as we make him out to be. But our show does a lot of melding of two worlds. In our day Shakespeare is the literary rock star so we kind of take that notion and put it into that time with our writers in our show and he is a rock star. So we play fast and loose with some of the facts there. I think in a weird way it’s kind of personalized him to me a little bit, as you just start to think about what it was like to create back then. And it mostly makes me think about the language, the sophistication of the language, the sophistication of the plot, and how long they take. Now I’ll admit, I’m a product of shorter attention span media, what it’s done to me, so to get to Romeo and Juliet and it’s a page-and-a-half Queen Mab speech just about dreams, I’m like, “Come on, can we tighten this up a little bit?” But an audience sitting there, I mean what else did they have to do? You know, and what lives were they going back to? But to sit and just to be fascinated just by language. And I gotta say that our current climate, that what we’re listening to everyday, and things being reduced now to 140 characters, and oratory just going out the window. The beauty of language and how important it is and how important language was to the people who were creating it and the people who were listening to it—I watch it now, I read it now with a sort of marveling at the attention to the word choice. Saw it in St. Louis. OUTstanding.